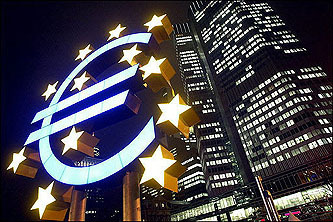 The €440 billion pledged by euro-zone governments isn’t immediately available cash in hand. Instead, a specially created off-balance-sheet entity will borrow the money, as needed, and then lend it out to the country or countries in trouble. The special entity’s borrowings will be guaranteed by euro-zone countries — excluding the country asking for aid. This construction helps skirt the EU treaties’ prohibition on one state’s assuming the debt of another….This portion would need approval by the parliaments of contributing countries, something that could delay a rapid payout of funds. Italics mine. I wonder if there are going to be any recalcitrant parliaments out there? And I wonder if any of the dozen or so fights it’s going to take to get approval for this fund will just end up making Europe look even more feckless than it already does? Remember what happened when Congress initially voted against TARP? This could turn out very well or it could…..turn out the opposite. Keep your fingers crossed.